As if I needed another reason to love Friday today, my email this morning had the topic line "you won.." and of course I jumped to open it. Rafflecopter picked me, Lucky #13 at One Little Minute to win a 2 half-yard bundle of flea market fancy from her sponsor Raspberry Creek Fabric. 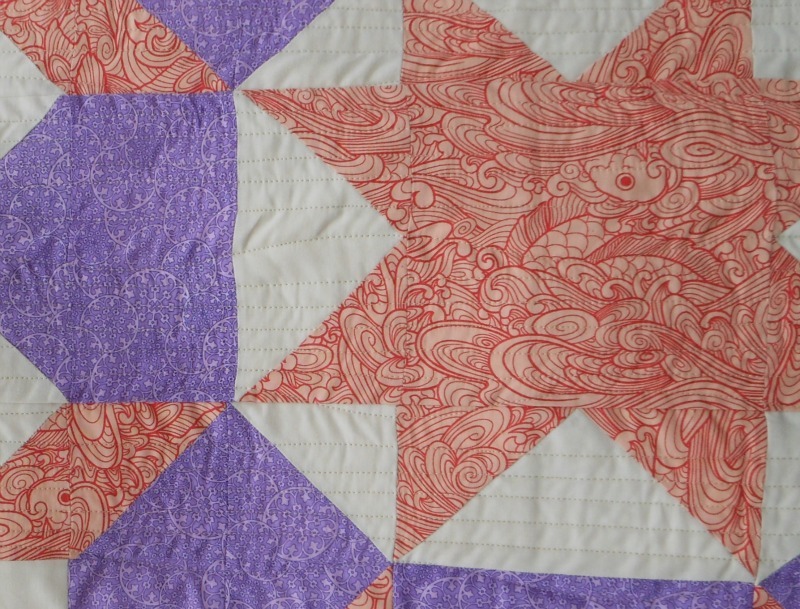 I came across Miranda's blog via Swim, Bike, Quilt! 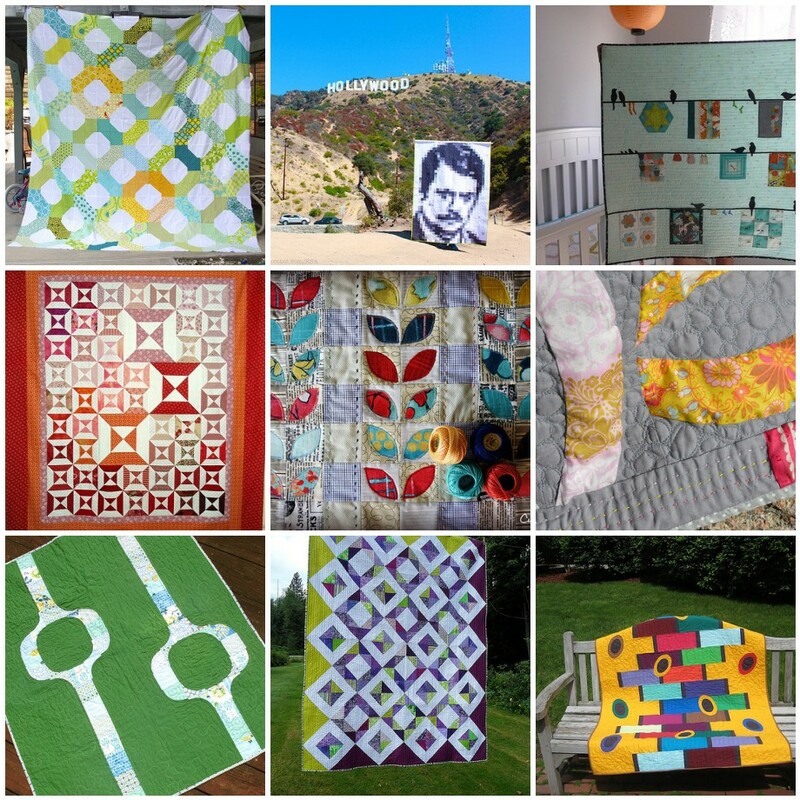 and the 100 Quilts for Kids Blog Hop earlier this week and thoroughly enjoyed her post. 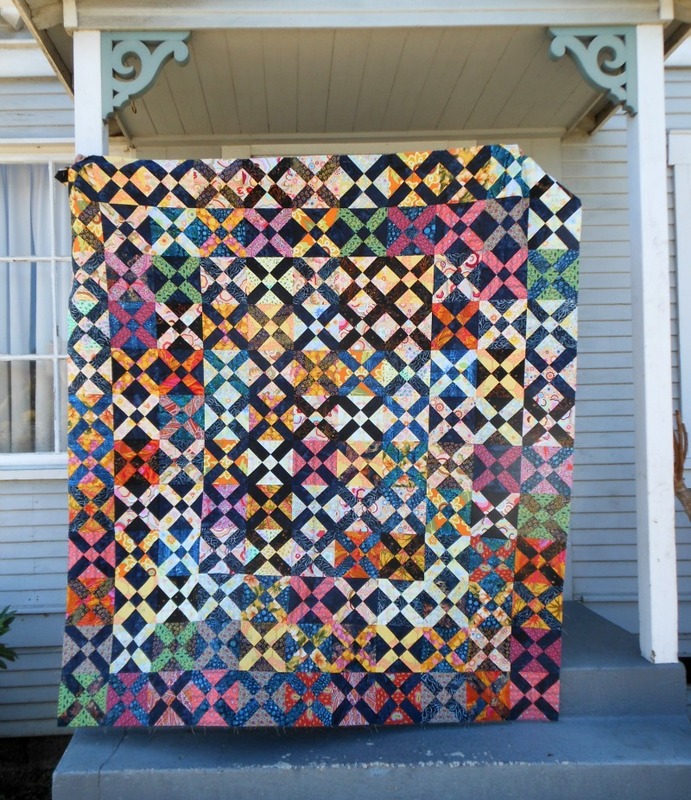 She tells a wonderful story about discovering the world of quilting as an apparel sewist and the steps leading up to making the Double Dog Dare Quilt. Don't you love that name? I totally need to use that tactic with myself. Read about it here. I came across this fun Hop with 144 participants and am trying not to get myself too distracted... but...they don't call it hopping for nothing. One click leads to another click! With the left over pieces from Chevron Cat for Kitty, I made this make-up clutch to test out proportion and procedure before teaching my son's girlfriend how to make one for herself and a friend. 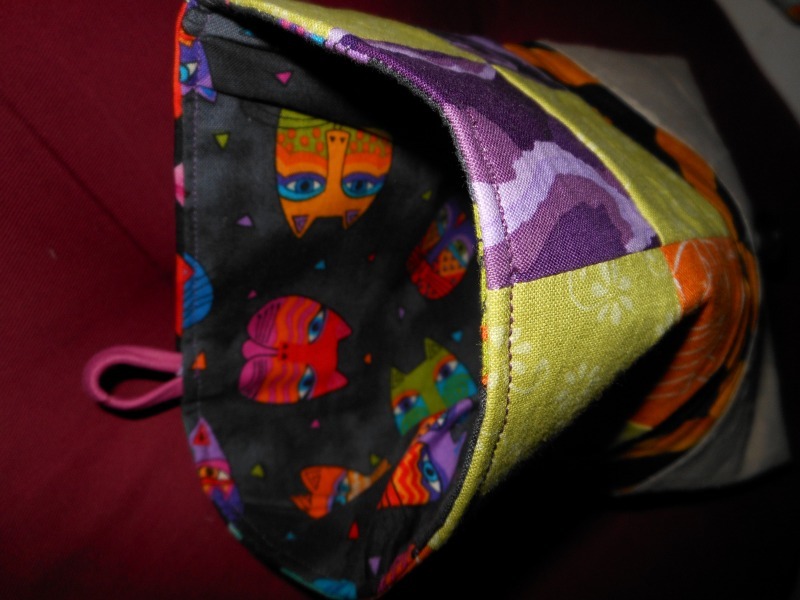 You may recall her runner and tote, two totally successful sewing projects. I washed up a small chunk of Essex Linen which turned into a wrinkled wad - mental note not repeat that! If you have any pre-washing tips on that subject I'd love to hear. The wider style hair band with a snug button worked out well. 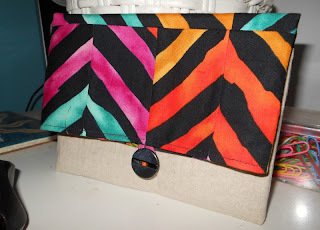 The end result was pretty cute with the mock chevron from striped fabric and will be a nice little gift. A few lessons learned which is the reason for a prototype anyway - we added a pocket inside of hers so the little things had a better place to be! 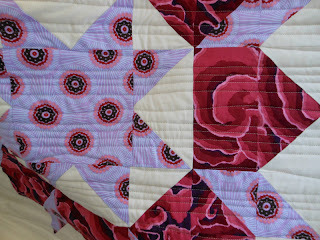 She also got to play around with swirly organic quilting with contrasting Aurifil on the linen and had fun. sorry no pictures, it was late - but trust me it turned out super cute! Yesterday, I had the pleasure of spending some much needed Girl Time sewing with friends. More of a Sew-Night than Day since I didn't get home until 10:30pm. We all had our plans and projects and although not all that much sewing was accomplished, we ate, chatted and had a great time. 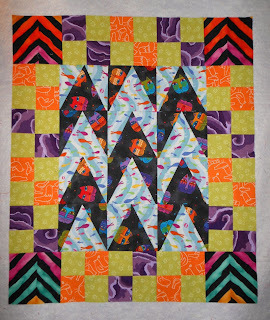 I was able to pin my strips for Not Your Granny Bee in charcoal and cut the strips for F+F=AMSB herringbone blocks for September. Hope you all have a fun holiday weekend planned. I have family in from out of town and just might play tourist and attend the Capitola's 60th Begonia Festival. 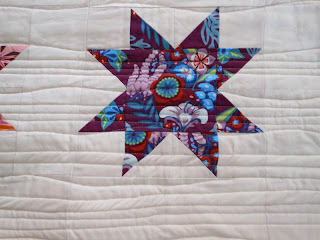 WIP Wednesday with guest blogger Michelle at CityHouseStudio has some amazing inspiration so be sure to check it out. It's been a busy week despite the lingering migraines trying to keep me down. 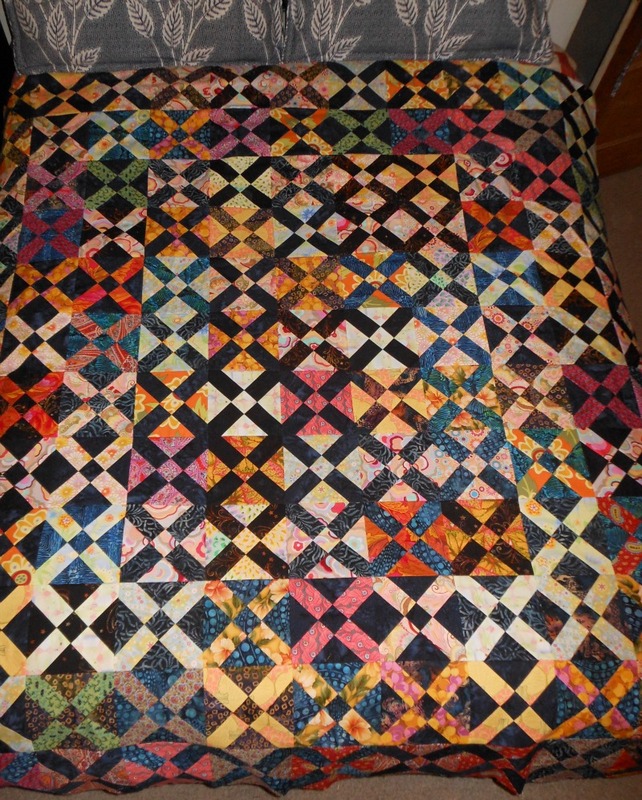 The pieced back for Old Italian Block aka: OIB is now together. 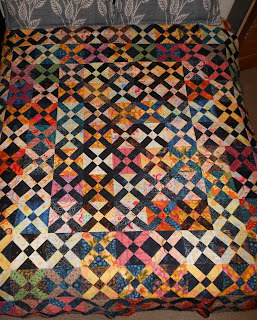 Ready to sandwich and quilt. 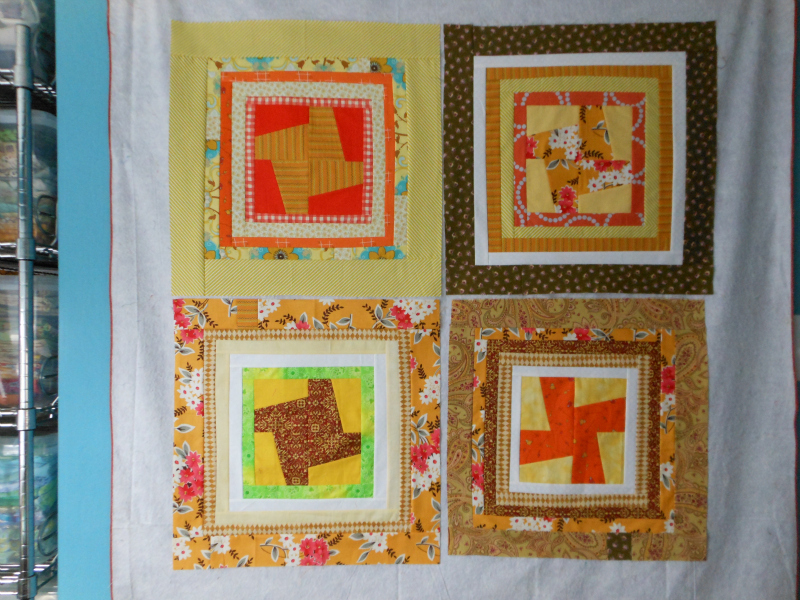 I'm in love with the F+F=AMS block choice (I say that every month) and pleased to have mailed them off while still in the month of August. 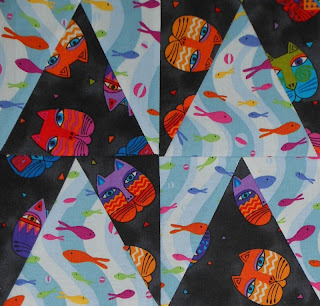 I added the border to "Cat Chevron for Kitty" and like how the center now floats and the little fish look like they are swimming around in circles. 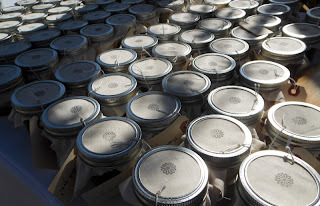 Have you ever seen the sardines at the Monterey Bay Aquarium? - my kids loved that tank - so mesmerizing. 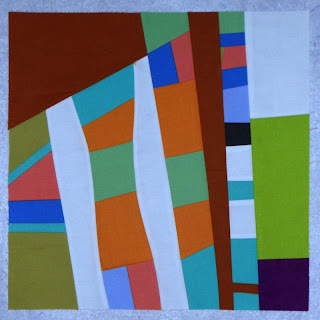 I've been admiring the Quilt Con blocks featured each morning in the newsletter and today in the Pick Up Stick grouping one of our South Bay Area Modern Quilt Guild members Jenny was included - and her husband Paul's Squarish Piecing block seen below on the design wall- congrats to them both - way to represent! Hope you're all having a wonderful week. My boys are back in classes although they drive themselves to college which isn't the same as holding their hand and walking them to class like the old days. Back to school around these parts also means crazy traffic jams on my commute to the office so I'd better sign off and get on the road. and this one to go along with it. I'm pretty pleased with the results and anxious to see the entire quilt put together. It's going to be awesome. 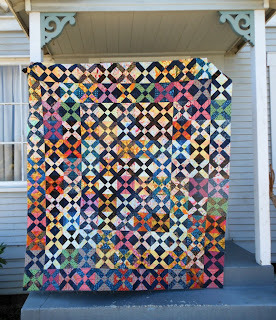 One of the many blogs that I follow is Laurie Wisbrun at Scarlet Fig. 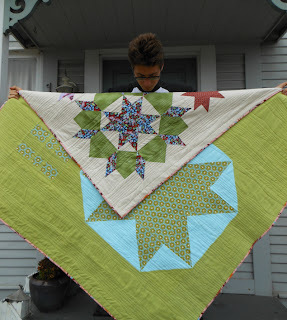 Today she posted a picture of the Insignia Quilt with a link to Sarah's tutorial at Bluprint Textiles where a give away of the adorable Olive the Ostrich is also going on. 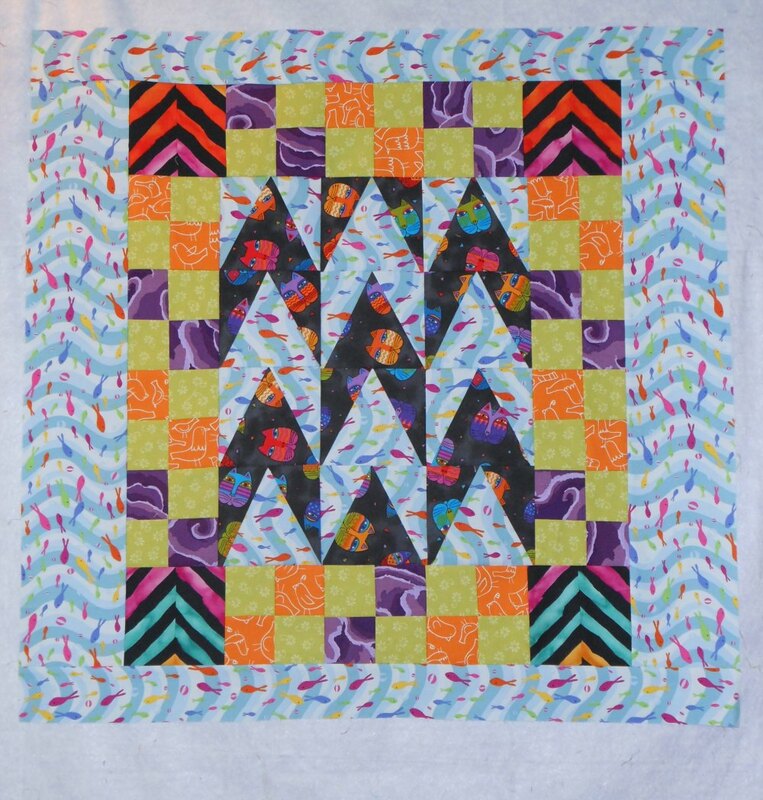 My favorite part of the quilt is the mix of Chevron with the feature fabric and the way that the various fabrics connect with each other. After a day and a half with a migraine I couldn't quite wrap my head around reproducing Sarah's pattern but was inspired enough to give the general concept a try. It felt good to play with the layout and add pops of color. The support fabrics were chosen based on the Cat fabric with the fish and birds keeping in theme. The Creative Grids 2 Peaks in 1 ruler that I picked up during Shop Hop finally got to come out of the shrink wrap. So often I buy rulers and never use them but it was time to Try New Things TNT. 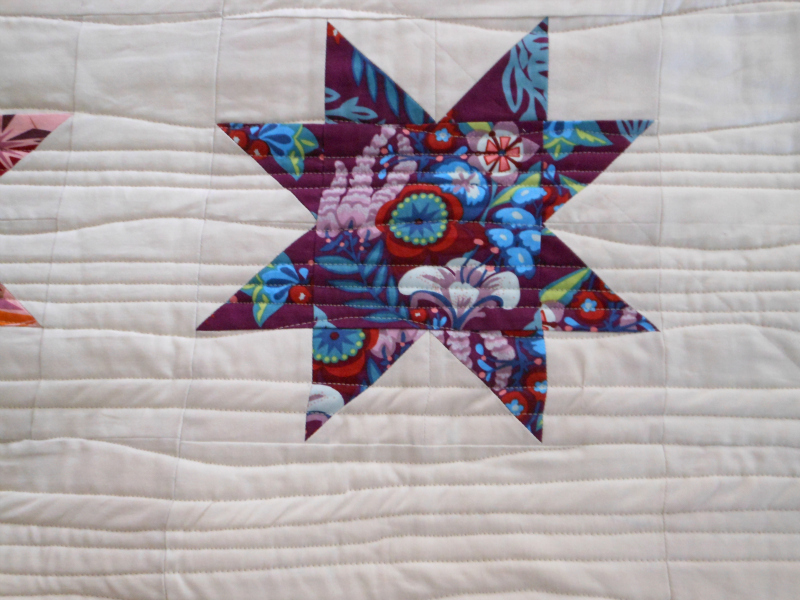 You can see that the points aren't perfect but in my mind they're good enough and I assume the Kitty Cat who will be sleeping on the quilt will agree. Linking up to Melissa at TNT. They may seem random and they kind of are... but these are a few of my favorite things from flickr this week. I couldn't figure out how to include the links to the original creators here but they can be found by clicking here. however, if you'd prefer that I didn't my apologies. Please email and I'll remove it. I always enjoy seeing mosaics of favs like on In Color Order and have only made them a couple of times. That's going to change because it's a great way to remind myself of projects that have inspired me without the distraction of browsing around aimlessly. A quick and easy resource for that "oh, that's right - I was going to make that pattern or try that technique". Because I love following blogs and am discovering new ones every day, I keep adding them to my Google Reader. So here's the dilemma - when is it too many to read and will I get to the point that I'll have to stop following? I'd be curious to know how many are on your list and how you decide. All of my strips are cut and the white background is joined ready to cut and sew. Here's a mock up so I could get an idea of value placement of my swap blocks. I had to do a bit of ripper action because my original layout had three dark purples that created an unintended stripe. I like this better. The OIB, Old Italian Block top made it to the porch for a picture just as the wind picked up. 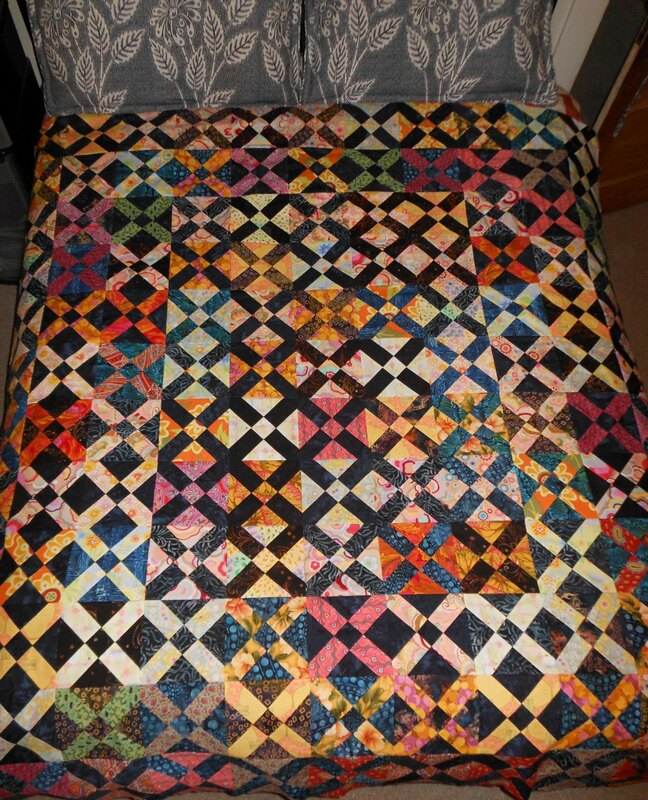 I'm the only one who will know there's a right side up for this quilt with the light-bright shades on the top and dull shades on the bottom. 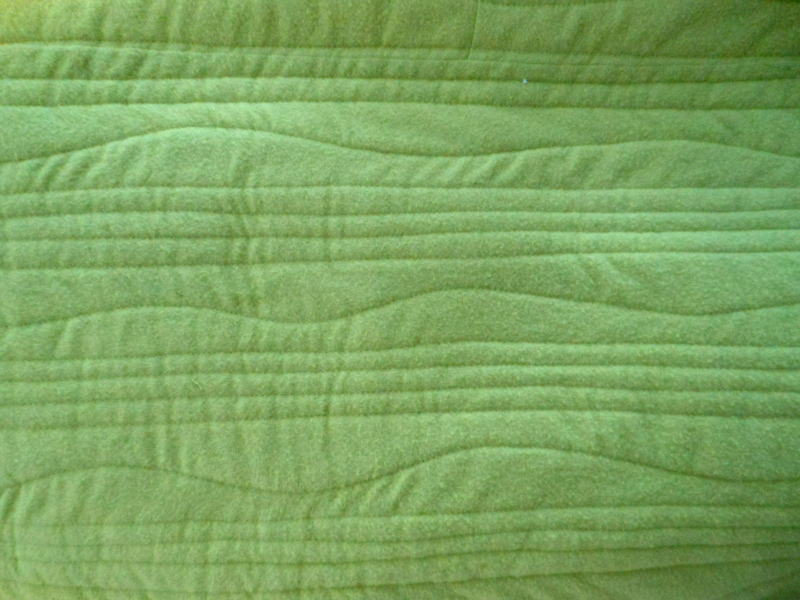 The underside of quilts always make me smile with the seams ironed open flat. 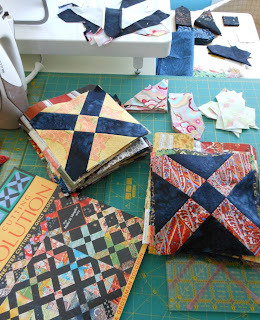 I'm wanting to try more patterns from the book Rotary Cutting Revolution once this is done. 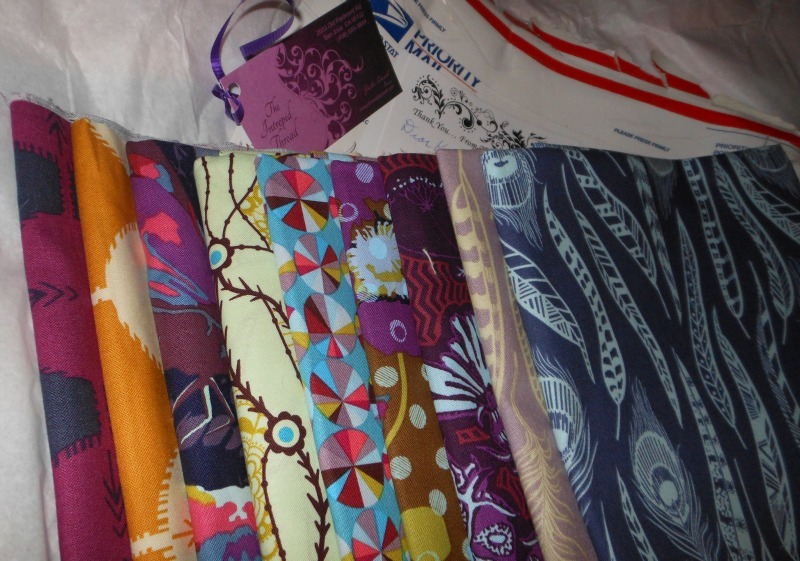 Not sure how she did it but the amazing Julie of Intrepid Thread filled and shipped my order of AMH Field Study before I could even blink. It's catch up time for the Sew Intertwined QAL with no excuses. 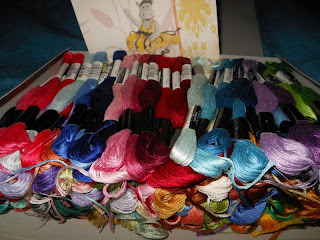 In other amazing news... my wonderfully generous prize for participating in the Zakka Style Sew Along arrived with a cute little note from Sukie - how'd she know I love Tina Givens stationary? 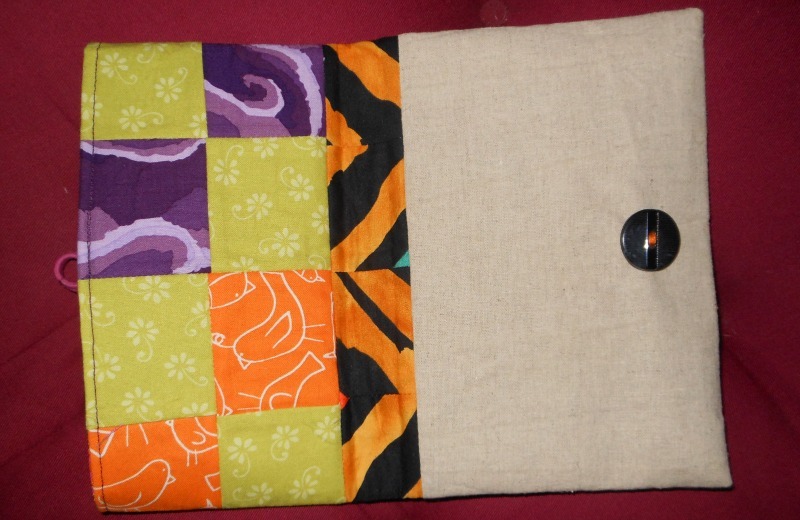 Check out the SAL at LRStitched. Get a load of all that Lecien Cosmo - yikes, I'm lucky. Thanks you Lindsey and Amy. 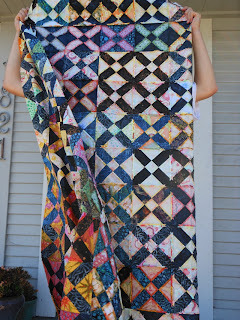 Linking up this week to Freshly Pieced WIP Wednesday with guest blogger Rebecca of Pieces and Cream! 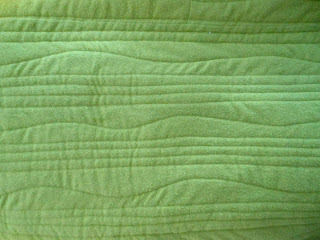 Usually I keep the blogging focused on quilting but today I thought I'd add some pictures taken at the wedding reception on Saturday. 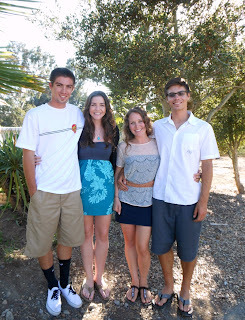 It was a beautiful celebration for a very special couple on a gorgeous day and a lot of fun. 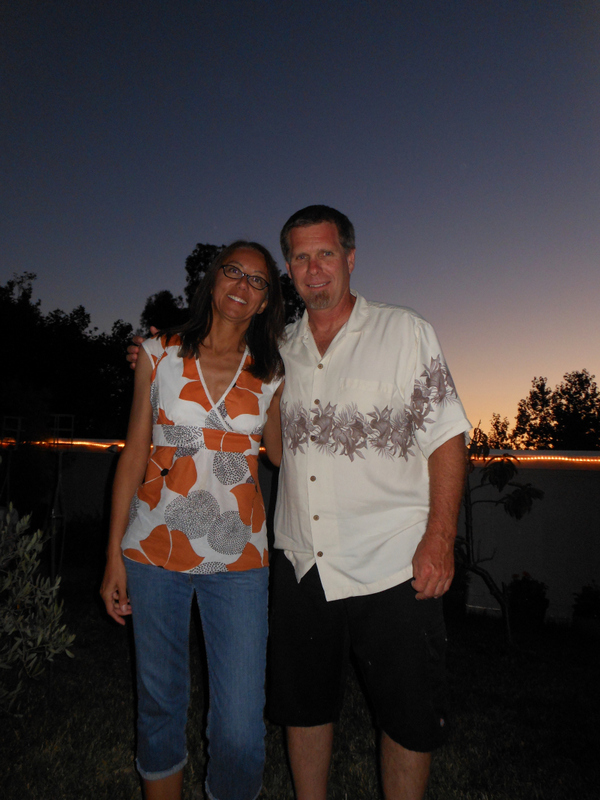 Here's my hubby and I late in the evening. Not sure why I look to be falling down, I didn't drink that much despite the open bar and endless cocktail options! 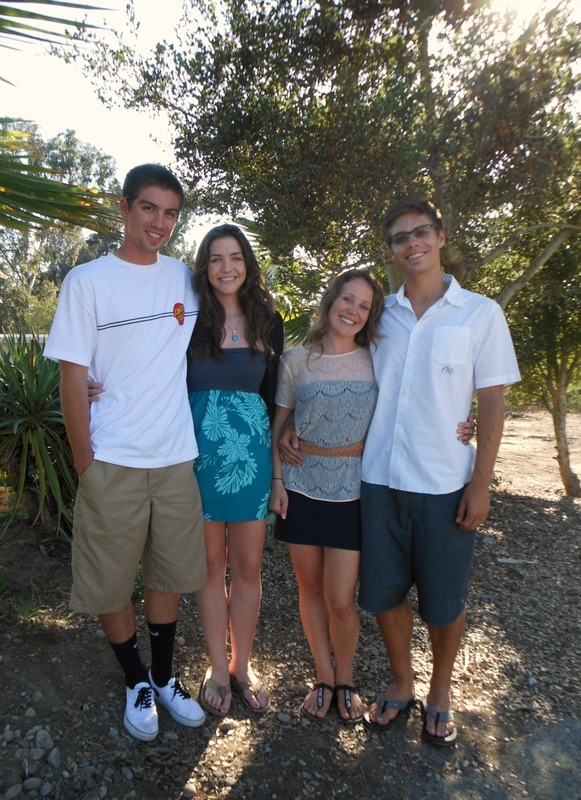 These are our boys (I mean, young men) with their lovely girlfriends who we adore. It was really special to all be together enjoying the festivities. These little jars were filled with cheesecake, chocolate and lemon, yum. 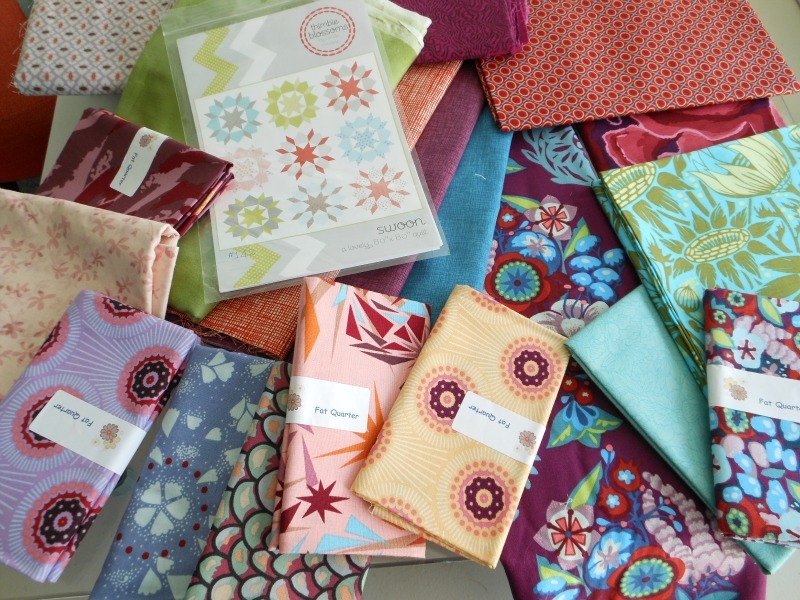 I love the stamped fabric and hang tags - a good idea to store away and use in the future. We all came home with succulents from the table decorations too. 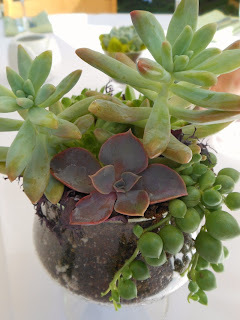 I picked mine based on the container rather than the plant because it has no hope of surviving poor thing. Because the wedding quilt isn't finished, I wrapped up an OIB square with a note about the design and a promise to have it complete before their first anniversary. 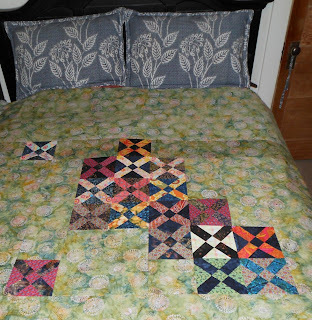 On Sunday I managed to sew the rest of the top together. 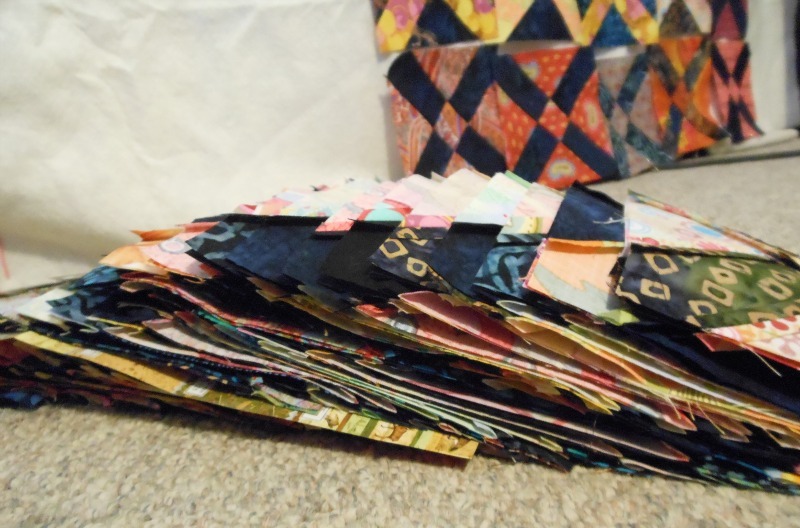 Here's a close up to show the variety of fabrics used, go figure...lots of Kaffe Fassett. Although some joints matched up better than others, I'm happy with the overall visual and glad I didn't make myself crazy with perfection. The enlarged size was a bit more work but worth it to make a true Couples Quilt. 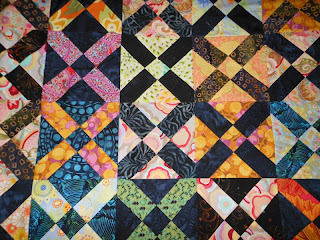 I am going to toss around ideas for the backing before committing. Right now I'm leaning towards green batik because I used only a hint of that color in the top. 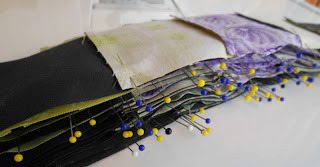 The binding will be some of the dark used and possibly scrappy. There are a few swaps that have deadlines creeping up and I'll be directing my time to those for a bit. Thanks for stopping by... hope you'll say hi. I could have spent weeks shuffling around the block. Playing with placement is one of my favorite steps especially when the results vary so much like in the Old Italian Block, from the book Rotary Cutting Revolution. After a couple of days of fiddling the final layout was decided, number/alpha tagged and stacked off of the design wall. 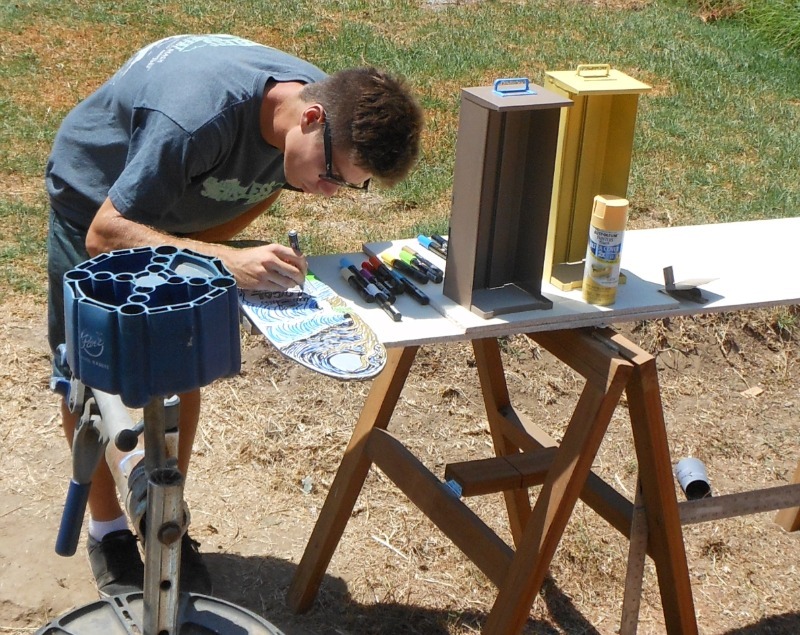 This is the photo I used to print for reference just in case I mixed up strips or got confused. It's a bit unnerving when the parts are off the wall and I kind of hold my breath until they are back together again. What system do you use to keep it all straight? Hope your weekend was enjoyable. This week I made progress on OIB, my several weeks running WIP but first I want to share something new. 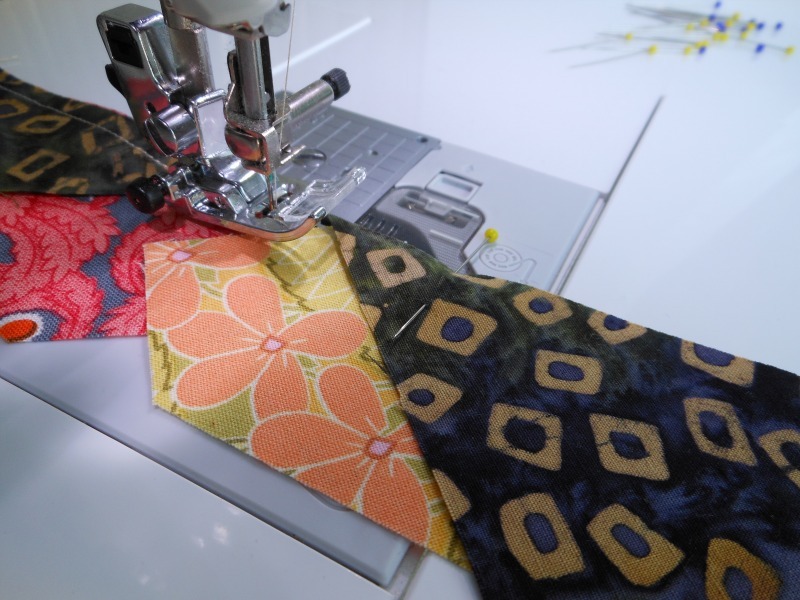 I took time out to sew up the 4 BOMs for Monday's PVQA meeting. These Scrap Patch blocks are biggies and boy did I want to keep them for myself! Notice my stash rack on the left for a little perspective of their size. 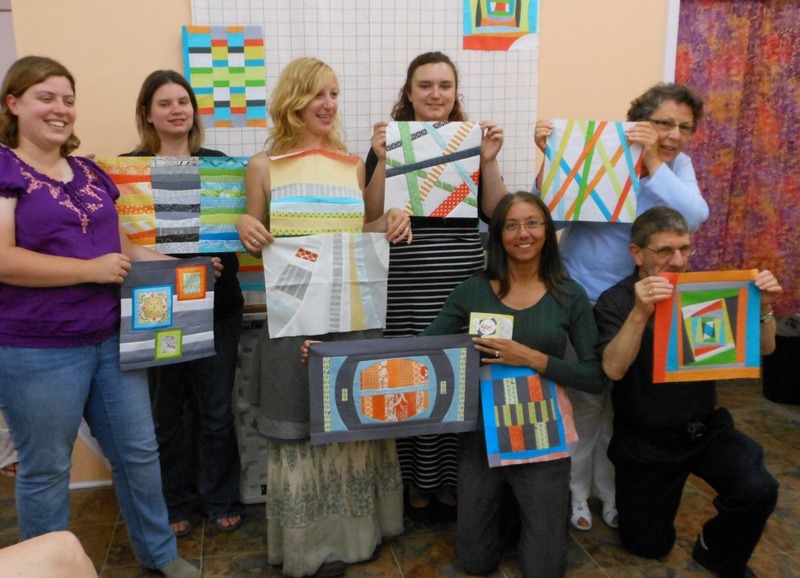 The winners were given all the left over scraps and a copy of Pam Rocco's pattern (for sale at SueDee's). As you may recall, I picked one up during Shop Hop by The Bay along with a complimentary fat quarter stack. 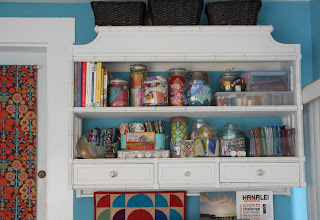 I just love the variety of scale in it mixing the chunky areas and tiny bits too. Using odd fabric with bold colors and a carefree approach is right up my alley. 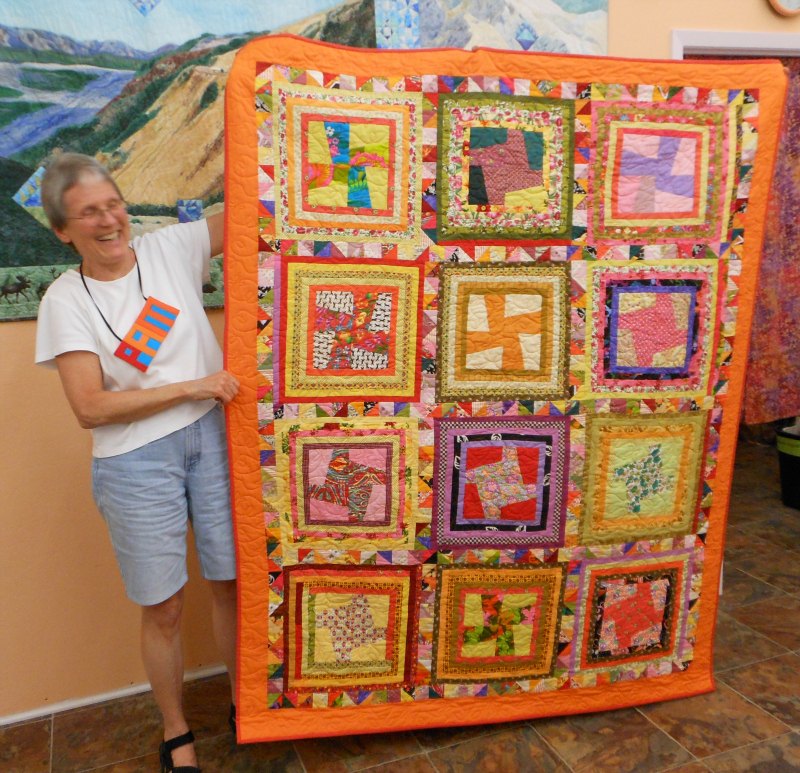 I'm so lucky to have the talented and inspiring Pam Rocco as part of my local quilting community. 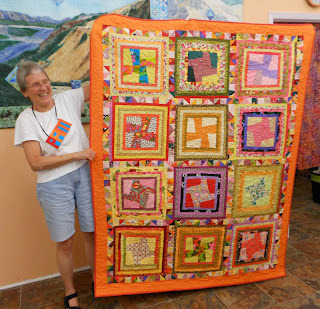 For years I admired her quilts at PIQF and patterns in Quilter's Newsletter never expecting to one day meet her and become friends. 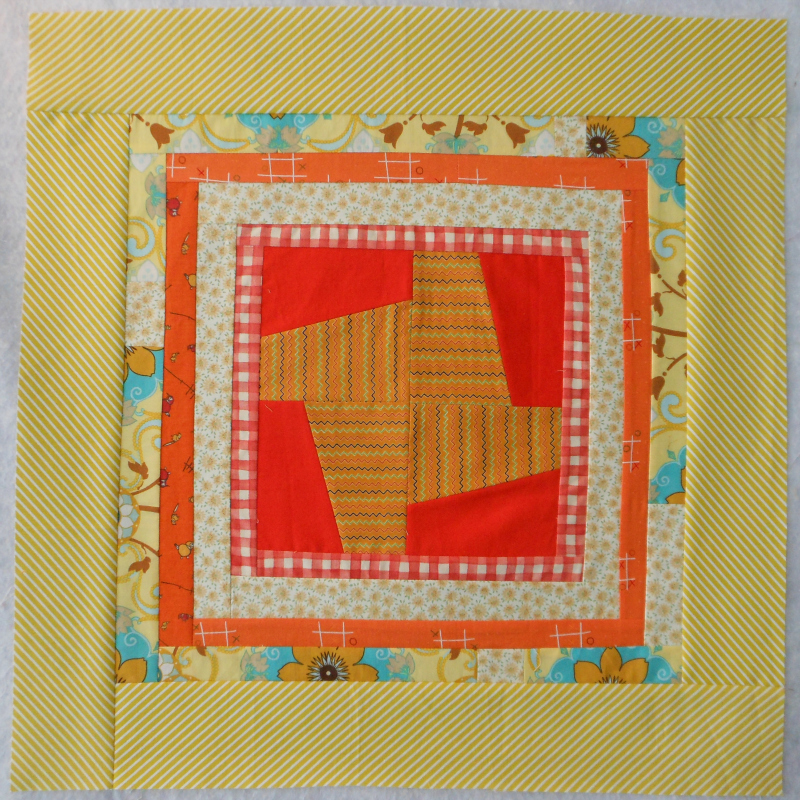 Browsing, I've discovered several must do patterns, Lure of Linen in an older issue from Jan/Feb 2008 simple and striking and more recently Pants Pocket and Cinco de Mayo top my list on their Free Patterns link. 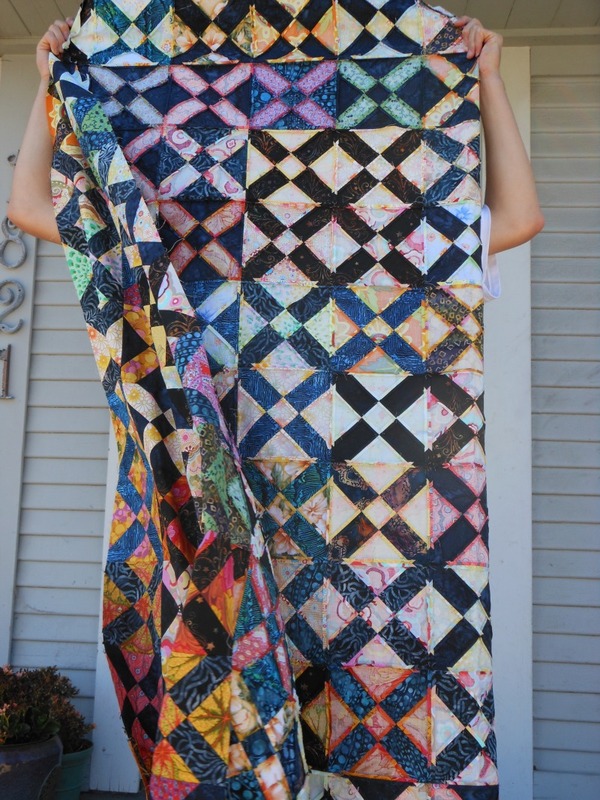 OIB size in question - help! 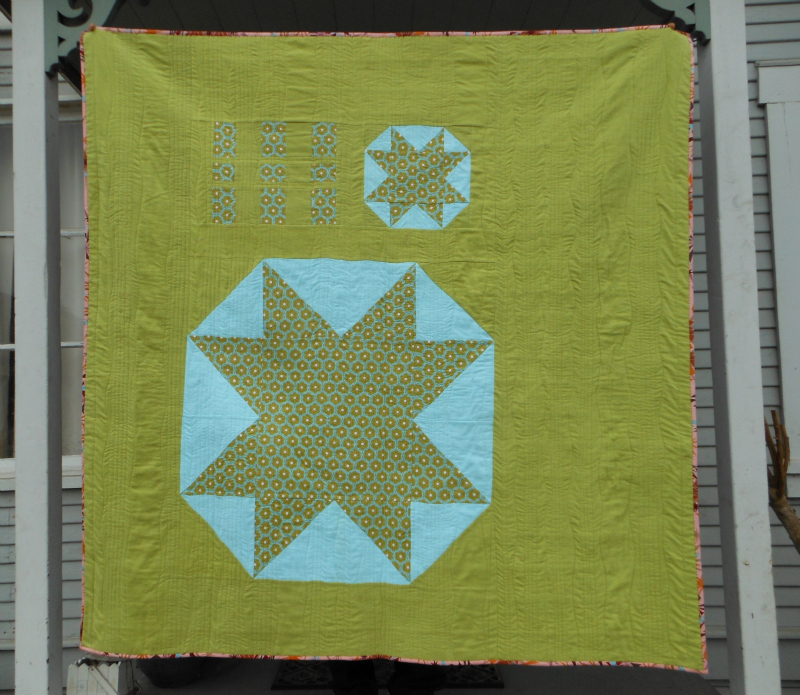 My OIB square count is now at 103 sewn and trimmed of the 132 target. I'm revisiting my decision to enlarge the pattern and honestly don't know if it's because I'm burning out or genuinely concerned about the visual effect of the change. I have plenty already cut out. 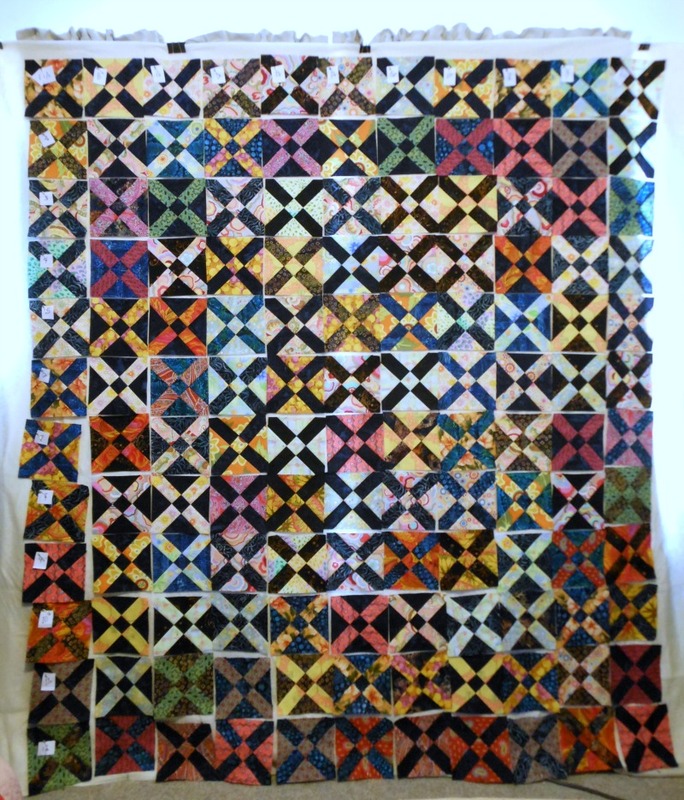 Adding more rows will cause the squares to appear smaller with a slightly busier overall look because of the modified ratio. It's pretty darn busy already and a huge appeal of this design is the successful light/dark optical illusion play in it which I'm nervous to mess with! 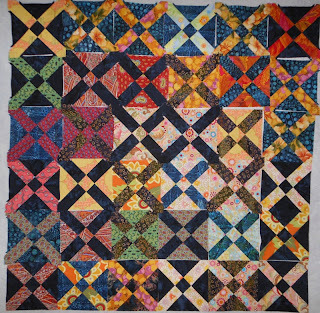 The ten by eleven layout on the pattern makes a 70x76 quilt with a 5" border but I don't want a border... so I'm left with a 60x66 quilt or my modified version with an eleven by twelve layout to get 66x72. 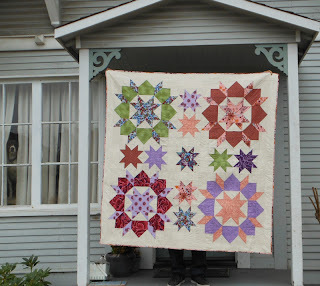 It is a wedding quilt for a couple so I intended to go larger - what do you think is better? In a bit of fun news, a couple of days ago Aurifil posted my Starred Swoon on their facebook page. Of course I was clueless since I don't have a FB account, but thanks to a comment on my blog I found out and got to see. Love, Love that thread and use it exclusively now. My new machine likes to be spoiled and so do I. I've only used 50wt but am wanting to explore the others. I've also had a ton of visitors to the blog thanks to Perfect Picture Polaroid swap and my tutorial link. The swap closed today with 100 members, 70ish participants and we'll find out how many blocks very soon. Linking up to WIP at Freshly Pieced where Cindy from Live a Colorful Life is the guest blogger this week. 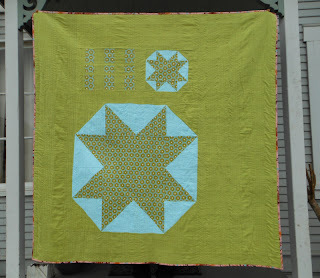 I've been enjoying reading The Name Game on her blog. Starred Swoon made it to the porch for a picture! Funny enough, I'm ahead of schedule on this one - can you believe it? 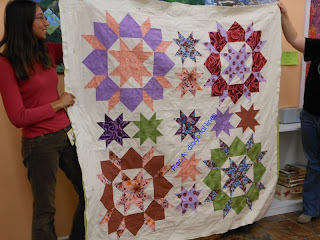 When I started the Swoon QAL on flickr with Katy at I'm a Ginger Monkey my plans were simple and hopes were high. Here it is 7 months later and the group is now called "the swooning on a hop along" with over a thousand members and nearly three thousand photos. 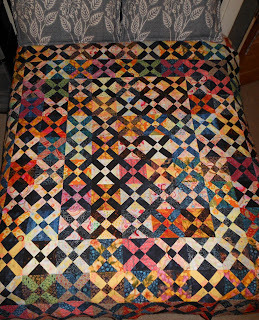 Despite the bumps and detours involved with this quilt, I'm happy to have it done and please with the results. The AMH Innocent Crush Shattered Punch in pink made for the perfect binding and the Super-sized and Mini-me Starred flannel back is certainly cozy. Buy enough background for the entire quilt and keep it together. When I packed away the project to take a break I didn't keep the remaining background of Kona Bone from fabric.com with the other parts and must have used it or misplaced it. My LQS Hart's had it in stock but the dye lot was quite different. I used it anyway but in certain lighting it's pretty noticeable. Baste Better. 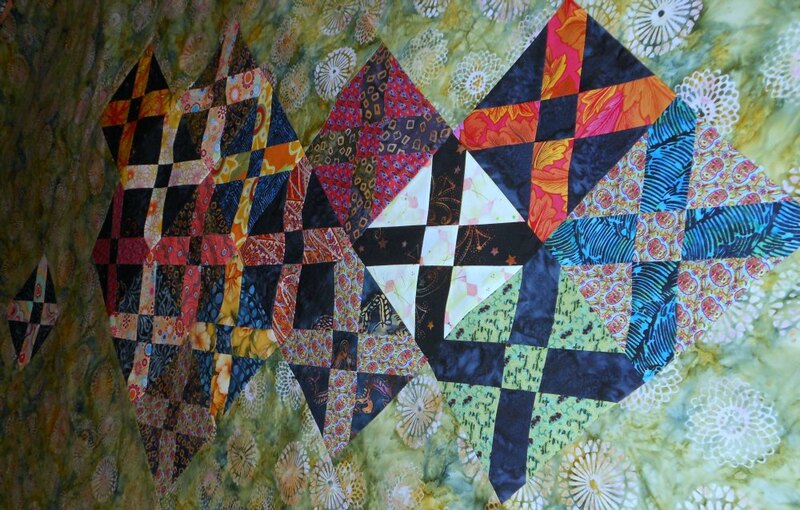 I was a little lazy with this step and wish I'd been more diligent. Keep Going... when plan A is a miss, move on to plan B and work your way down the alphabet all the way to Z if need be. 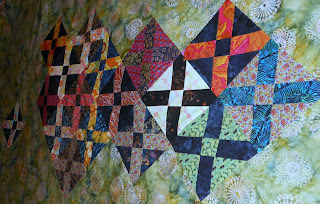 check out At the End of the Hallway August linky party with Katie at from the blue chair - feels great to have a true finish on a big project for the month. 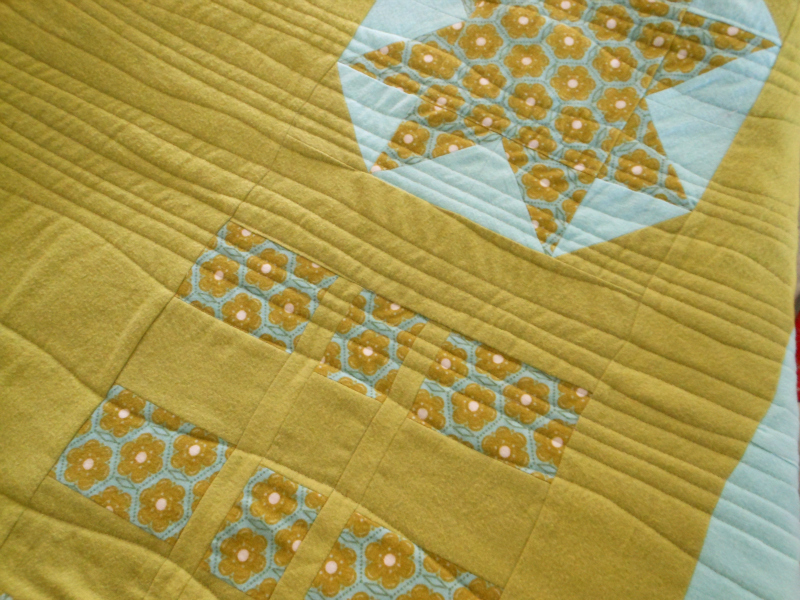 Well, the road to Starred Swoon hit a few bumps in the quilting stage. Indecisive might be the best word for this quilts journey. I wanted to try straight stitch quilting because it's so modern and so well done on much of what I see out there. Plan A: Two diagonal straight lines later it was seam ripper time. So I thought, wiggle lines along the seams instead and committed to that. 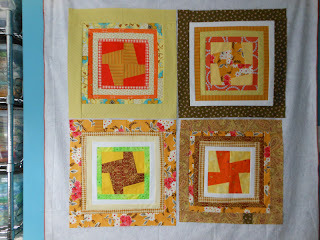 Plan B: Not right either but since I wasn't about to rip out all of the rows I decided to go for combining the two. Plan C: insert straight lines between the wiggly ones and that's were I'm at. Not hating it. Not loving it. Charging ahead. 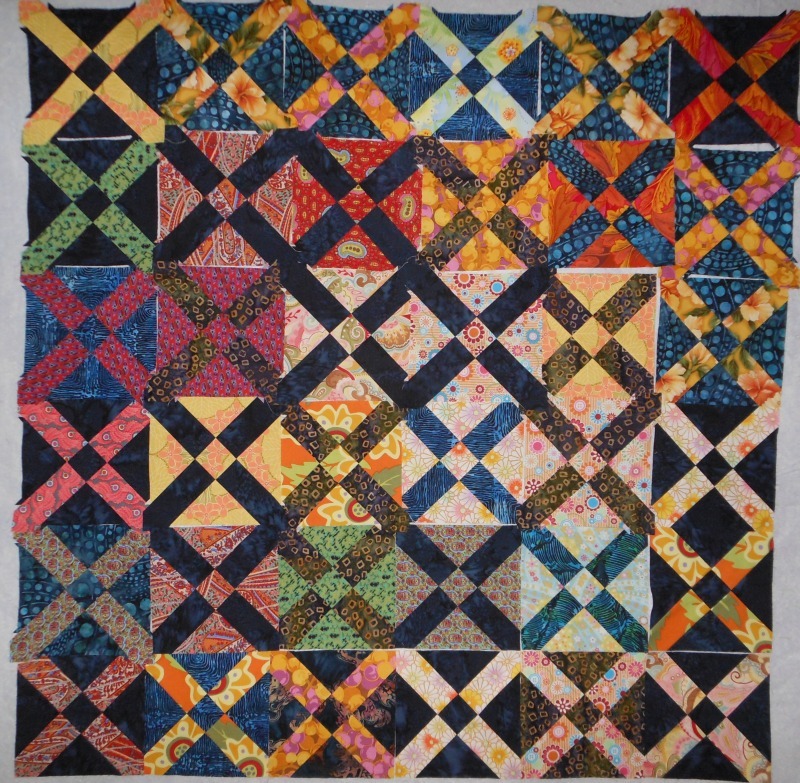 My vision of the mix shows pretty successfully on the back solid flannel picture below but unfortunately doesn't translate as well for me on the front of the quilt. What's a girl to do. At least I tried something new! 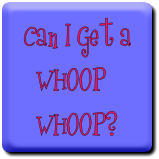 Can I get a Whoop Whoop? Linking up to Diane at from the blank page who encourages us all to make our visions reality puckers and all. 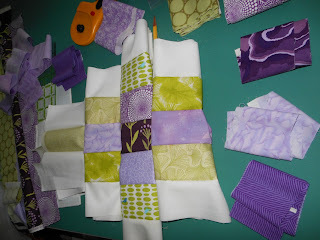 She has also started a Master Link linky party page - brilliant. 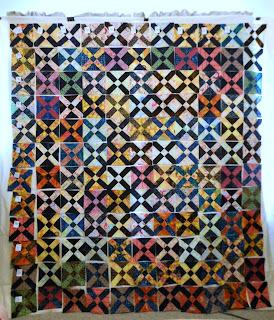 Finally hit the halfway mark with 65 blocks done - they aren't all trimmed and won't fit on the design wall but here's a peak. Progress hit a slump and then last weekend I got back at it. 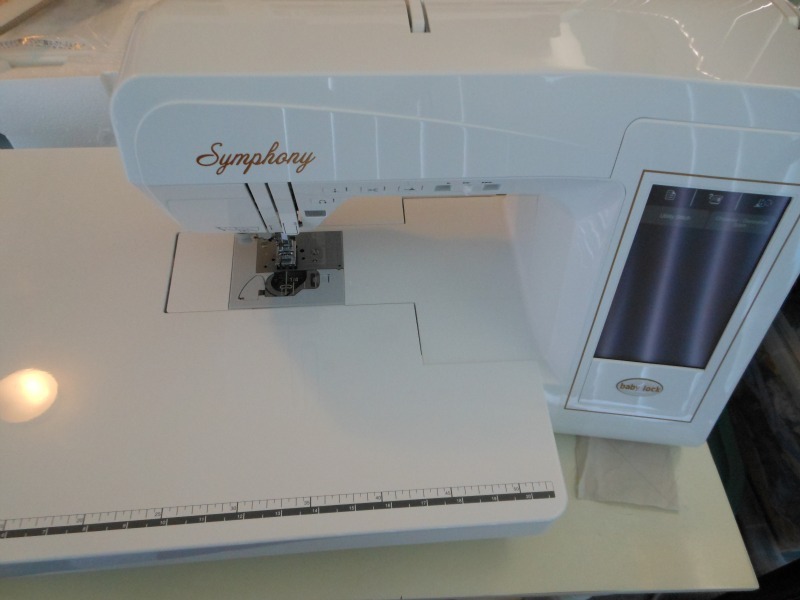 Chain piecing on my new Symphony with the pivot feature is pretty sweet. 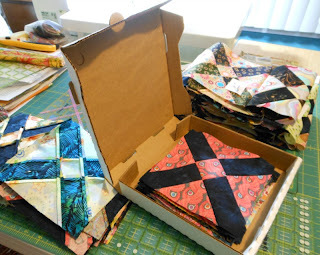 Feels good to be over the hump on hump day - Linking up to WIP with guest blogger Bethany (Make Me A Quilt) at Freshly Pieced and Plume and June's link up. 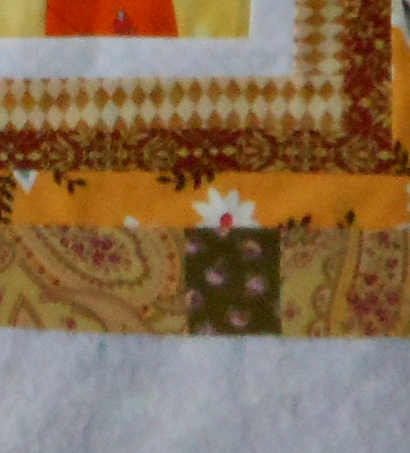 Swoon is sandwiched and I started to straight line quilt it but took a seam ripper to that idea. 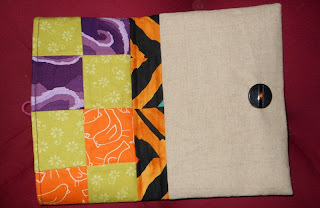 Now I'm thinking a wiggle line inspired by this pillow by my flickr friend Melissa aka Mamma Missa. How's the week been treating you?? At the thrift store I'm always on the look out for containers even when I don't know what I'll do with them. 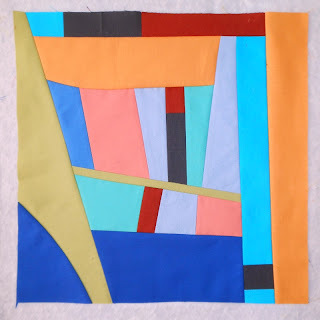 When I saw this one - the purpose was obvious - a place for my strips to lay flat and happy. 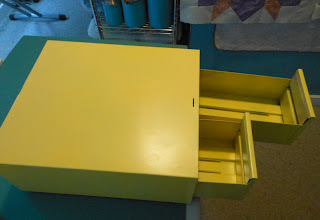 An old library card catalog that had been used by the last owner to store recipes in. I browsed a bit but the paper was a pretty musty so they got recycled. It tucked nicely between the plastic storage tubs on the metal rack I have in my sewing room. 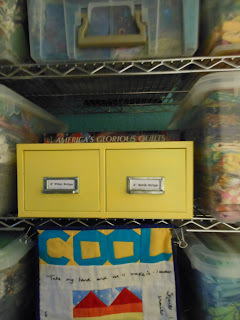 My stash is bursting and I didn't think I could squeeze any more in but I managed. I interrupted my son drawing on his skateboard to get him to spray paint it yellow for me. 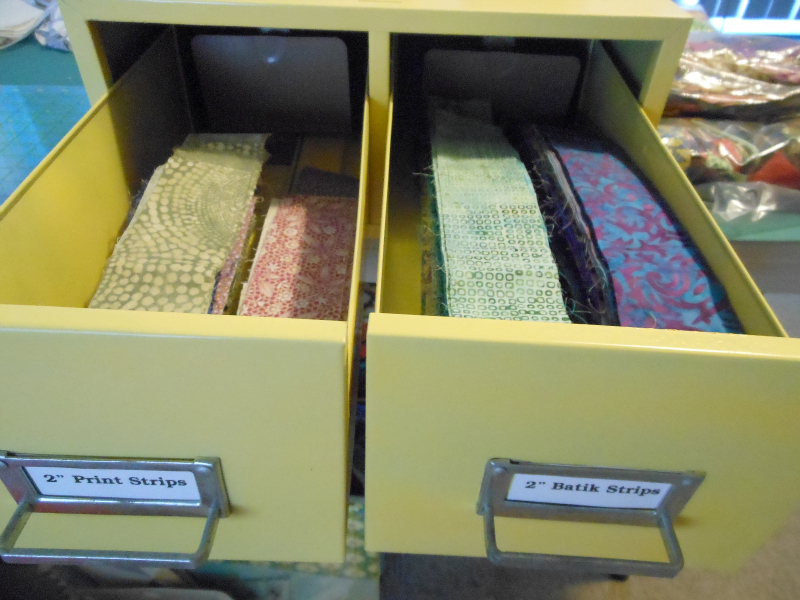 Eventually I'll probably make one drawer 2" and the other 2.5" because my stash of non-batik strips is pretty thin. It certainly works better than storing them in the crumpled baggies seen in the background of the picture below. 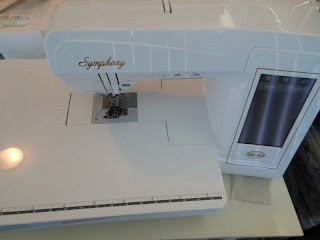 Now for a big deal in my quilting world: I traded up my Baby Lock Serenade for a Baby Lock Symphony. I'm a creature of habit and don't do well with change but I finally plugged it in tonight and will report back soon. News like that deserves a post - so stay tuned.